Reader Question: What’s Included in the Complete Armchair Builder Product Package? - Armchair Builder :: Blog :: Build, renovate, & repair your own home. Save money as an owner builder.- Armchair Builder :: Blog :: Build, renovate, & repair your own home. Save money as an owner builder. Armchair Builder response: That is correct Sydney. 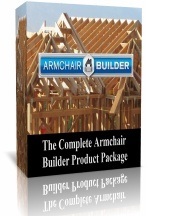 When you purchase The Complete Armchair Builder Product Package, you will receive all of the Armchair Builder tools available in digital, pdf format. We have found over the years that most owner builders, those people wanting to take on the general contractor role for their building projects, need most of the tools we offer. So instead of making the owner builders purchase each individual item, we’ve packaged them together to save them money. Here is a listing of the items in The Complete Armchair Builder Product Package along with a brief description of each. This is a 175 e-Book that walks you through the complete process of building a new home. We start by discussing the options available for building a home including hiring a full service general contractor/builder, using a building consultant while still taking on the overall responsibility for the project, going the full blown owner builder route where you are completely in charge and reap the full benefits, …etc. This e-book ties together all of the Armchair Builder resources and discusses how they are used throughout the building process. This resource gives an in depth view of what should happen each day throughout the building of a new home. When should the roof trusses be delivered? Does the fireplace go in before the rough plumbing? At what stage of the process does the ceiling insulation get installed and how long should it take? How long does it take to dry-in the home so rain is no longer a factor? These are just a few of the answers included in the Armchair Builder New Home Schedule resource. A major part of the success of any building project is buying the correct piece of land to build on. Choosing a piece of property that has hidden problems can add tens of thousands of dollars to the overall project costs. This Lot Purchase Guide helps guide owner builders through the checklists and critical questions that need to be answered prior to signing a contract. A set of house plans gives the trade contractors and suppliers a two dimensional view of what is going to be built. However, it doesn’t go into the details of the types of materials and finishes that go into the home. The Scopes of Work and Specifications will give them these details. This important document also spells out how the owner builder expects the work to be completed and gives strict details to trade contractors. This includes quality requirements. For example, the drywall scope of work and specification could instruct the drywall contractor to clean all drywall mud droppings from the subfloor prior to leaving the job site. One of the most important tasks when building a home is pricing out each work activity. We’ve learned over the years how important it is to tell each trade contractor and supplier providing a bid exactly how you want the bid broken down. It’s not good enough to have a single dollar figure on the bid. By breaking each bid down into unit prices (i.e. price per square foot) and then adding the estimated quantities, the owner will know exactly how their money is being used. And if they want to make a change, it will be obvious what the additional work will cost without rebidding. This Armchair Builder resource gives the person managing the job site direction as to what needs to be done each day. For example, let’s say the electrician is finishing up the rough electric. What should the person managing the job site do today? Well, they should start by making sure the rough electrical inspection has been called into the building department. Also, the insulation contractor should be called to make sure they are aware they are coming up on the schedule. This tool gives the owner builder a ten thousand foot view of how a new home comes together. The New Home Process Overview lists out the key items that are completed in the order in which they are completed. Critical to the success of any new home build, the Armchair Builder New Home Budget gives each and every line item that should be included in the budget to build a new home. Included are things like a contingency budget (for unforeseen items), financing (i.e. bank loans), insurance (to cover the owner in case of injuries on the job),…etc. This resource also includes the typical percentages (of the total cost) for each budge line item to help the owner builder identify items that could be priced too high. The more organized the owner builder is, the easier this project will seem. The Subcontractor Information Sheets capture all important information from trade contractors and suppliers so they easily found when needed. Things like insurance carrier along with contact person, phone and email. After building hundreds of new homes, professional builders start to see reoccurring problems. This guide is compiled from years of building experience and describes the common problems associated with new homes and discusses how a pro builder goes about identifying and repairing them. If you would like to look see more details about The Complete Armchair Builder Product Package, or any of the individual tools we offer, stop by our e-Store for details.